The first cut of 2012! Well today saw the grass get it’s first cut of 2012. Mr Mac had been trying to put it off for as long as possible. One reason was that we had some serious moss treatment done at the end of last year and wanted to give the grass a chance to grow. However, the main reason the grass had not been cut before now is that after the gale force winds in December and then January the grass was littered with broken twigs and branches and it was my job to pick them up! Job now done. Back now very sore. Grass cut and looking good I have to say. If we ever need to buy anything from the garden centre we try to do it on a Wednesday. The reason for this? Dougal’s Discount Wednesday – 10% off all purchases. Off we went with a list and back we came with more seed compost, seeds for my hanging baskets and maris piper seed potatoes. I had forgotten about my hanging baskets and have not actually planted anything appropriate. So after a quick look at some seed catalogues I decided on Monopsis, Nicotiana and Trailing Petunia. What I actually bought was pale pink Dascia and fuschia pink Trailing Petunia. The baskets will hang along the “blue wall” I hope to create so hopefully will provide a lovely contrast. I also decided to pot on my 6 courgette plants. They had been getting quite comfy in the house but 2 of them were starting to keel over! They have now been rehomed and relocated to the greenhouse. I just hope they are still upright in the morning. 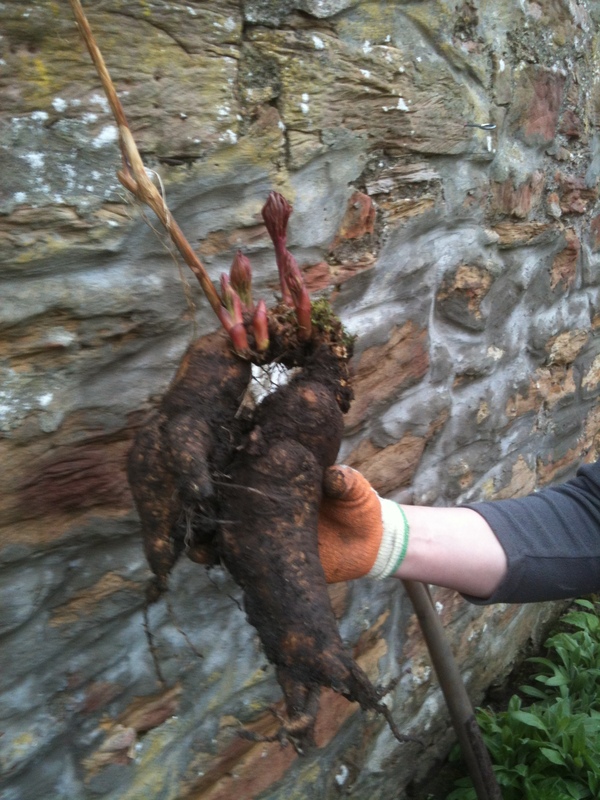 Check the size of the tuber on this! Mr Mac decided to relocate a peony rose which was impeding progress of his new path network. Check the size of the tuber!